IMS Company - Glass Cleaner, 17 oz (500 ml) Trigger Bottle Extra Strong Glass Cleaner Provides Streak Free Cleaning with a Brilliant Shine for all types of Glass and Mirror Surfaces. Excellent for Removing Grease, Dirt, and Oil on Sight Glasses and Machinery/Equipment Windows. 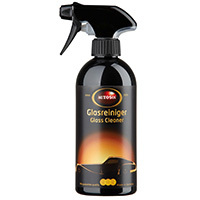 Glass Cleaner, 17 oz (500 ml) Trigger Bottle Extra Strong Glass Cleaner Provides Streak Free Cleaning with a Brilliant Shine for all types of Glass and Mirror Surfaces. Excellent for Removing Grease, Dirt, and Oil on Sight Glasses and Machinery/Equipment Windows.